Opening up today’s BiR is a highly-regarded offering that comes out every February from NoDa Brewing Company in Charlotte. Hop Cakes Imperial IPA comes out of their bi-monthly Specialty IPA series, and stays true to the name, with loads of Vermont maple syrup included in this recipe. The numbers on this beer are massive: 10.2% ABV, somewhere in the neighborhood of 110+ IBU. It pours a clear solid gold color, and the maple syrup first comes through in a powerfully sweet aroma. In the beer itself, I found plenty of booy sweetness and maple syrup notes, but they surprisingly didn’t overwhelm me (and I’m one that can be overwhelmed by that sweetness fairly easily). Other flavor notes include just a hint of pine and a mild hop bite, and the booziness ramps up as it warms. Second up today is COAST Brewing Company and their Dead Arm American Pale Ale. 6% ABV, this beer pours a pale gold color with a very slight haze. I found the beer to be fairly light in flavors and body, with citrus and other fruit notes. A mild hop bite with some nice grassy and crackery notes are also present—that hop bite tended to really come through in the finish. 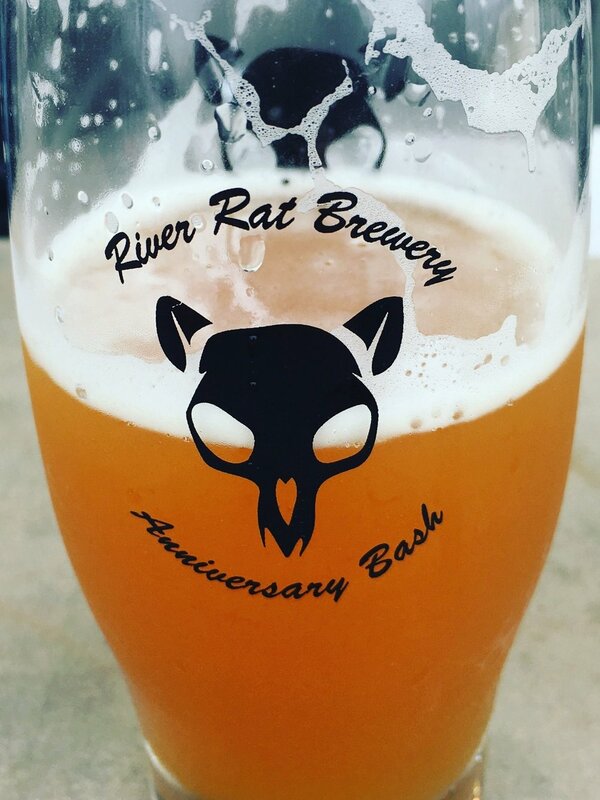 Recently celebrating their 5th Anniversary, River Rat Brewery is one of the original “Big Three” commercial craft beer producers that inhabited the city of Columbia, SC for a few years before the more recent boom of breweries. Always the best of the Big Three, in my opinion, River Rat combined good beer with a highly inviting indoor/covered deck/pure outdoor space at their production brewery and tasting room. 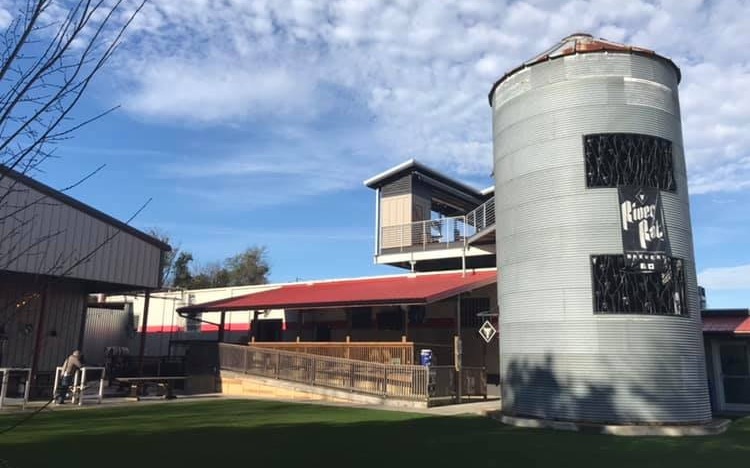 In 2018, they improved their customer space even more with the addition of a rooftop deck, an area even more attractive on South Carolina football gamedays, given the brewery is less than a mile from the university’s football stadium. Photo of River Rat’s outdoor set-up, courtesy the brewery’s Facebook page. Rooftop deck, with the view of the University of South Carolina’s Williams Brice Stadium in the background. Another upgrade is the replacement of the outdoor grass with astroturf, much more ideal for the amount of foot traffic this brewery gets, especially on the weekends. With a full calendar of events, such as trivia, movies, and more of the standard brewery event fare (to say nothing of the exceptionally busy football game days), River Rat is good at drawing a crowd. The brewery produces a prolific beer list, with 15 or more offerings on tap at any given time, along with cans of their core brews. Their malty Hazelnut Brown and Broad River Red Ales are notable, as is Astronaut Sauce, their most recent attempt at a New England IPA. I will have a few more offerings in an upcoming Beers in Review! Beers in Review: I'm Drinking It Right Now! Way back when, I used to do the occasional “live to print” beer review, and I have one sitting in front of me. So, let’s going ahead an check out this offering from Westbrook Brewing Company. The Low and Slow Helles looks to be a new/limited offering (this is the first I’ve seen it, anyway) and their version of the classic German-style lager. Highly sessionable at 4.8% ABV, the beer pours a crystal clear pale yellow color with a white, pillowy head. Flavors are light, with cereal notes and a grainy sweetness that comes fairly standard in the style. Basically, think of your “preferred” mass-produced pale macrolager, but with quality ingredients and the flavors turned up to about 15. THAT is this beer. Tasty, crisp, perfect for the upcoming South Carolina summer. Moving to the non-live portion of the post, we’re gonna stick with a German style in Brooklyn Brewery’s Unfiltered Pilsner. This beer checks in at 4.3% ABV (I don’t think I’ve ever reviewed 2 sub-5% beers in one review before) and pours a yellow straw or hay color with just a little bit of haze—really, it wasn’t as hazy as I expected it to be, given the name. Floral (early in the tasting experience) and grainy (late) notes make up most of the flavor profile, along with some peppery notes in the back side, as well. Solid, but not spectacular, and a little bit different offering out of the Pilsner category. Finally, I didn’t intend on doing 3 different German styles, but here we are. We recently passed the celebration of Mardi Gras, so no better beer to review than Louisiana-based Abita Brewing Company’s Mardi Gras Bock. 6.5% ABV, has a fairly light body, pours a clear light caramel color. Plenty of malt, floral notes, and sweetness present at the front, though the sweetness level was not too much for me. The back of the drinking experience was more grainy and bready, and there was something a tad wonky towards the very end and into the aftertaste. Not a bad beer, at all. Just a little bitter thing that stops it from being terrific. So, since I got a new computer, I had to archive my review tracker. I don’t know off-hand whether or not I’ve reviewed this first beer yet. I’m guessing yes, but my rule is six months, and it’s DEFINITELY been longer than that…I can tell by how little writing I’ve done in that time. Moving on. We begin in the Charleston area with Washout Wheat from Holy City Brewing Company, one of my favorites from the lower part of the state (at least, amongst beers that make it up here). The beer checks in the low 5s in ABV (I’ve seen different numbers from different sources; the HC site says 5.3) and pours a fairly hazy dark straw color—pretty much on point for style. Holy City says they let the base ingredients (namely wheat and yeast) generate this beer’s flavor profile without added ingredients. Resulting flavors include cloves, and a hint of banana that comes through more at the end of the drinking experience and in to the aftertaste. Light flavors and a refreshing, effervescent mouthfeel make this a solid summer wheat beer. Next is Birds Fly South Ale Project and Apologize Less #6. The sixth in their series of double dry-hopped IPA, it is, essentially, a New England IPA that checks in at 6.3% ABV. It pours quite hazy, and reminded me of orange juice, frankly. I got grassy notes, along with orange/citrus and just a hint of pine tree; the pine really came through in the finish. There was also a mild hop bite that passed through the entire drinking experience. In the end, I found this to be a really tasty NE IPA. Leading things off is Charleston’s Revelry Brewing Company and their American Amber Ale, which is simply called Red. Now, I’m presuming this is a Revelry limited release—the website doesn’t even acknowledge the beer’s existence, and the only web presence I could find of Red was through Untappd, the beer-logging app/website. Even there, there was no ABV or IBU data to be had, so let’s just forge ahead. The beer pours just like an Amber Ale: a clear orange-gold color, and it had a pretty heavy mouthfeel. The flavor profile was as expected, with malty caramel and dark sugar notes, and maybe even some dark chocolate, as well. I was not a fan of the finish. I found it surprisingly bitter, which is fairly out-of-style and put me off on the beer, a bit. If you’ve read this blog with any regularity, you are well aware of my love for Highland Brewing Company. One of their newer year-round offerings is the sessionable Daycation IPA. Coming in at just 4.9% ABV and 40 IBU, Highland brought a varied malt profile, including rye and oats, to create a balanced, quaffable Session IPA. It pours a cloudy, golden straw color, and I felt floral notes were really at the forefront of the tasting experience. Other flavors included moderate citrus and mild spicy and herbal notes. The finish featured a slight hop bite, but was otherwise fairly clean. Six-Pack of News, Volume 31: Why is 3.2 Beer Still a Thing? I need to give a shout-out to good, ol’ Rod J. for posting a couple of these on the Twitter (check out his BeerVentures here). It would be an understatement to say that inclusion and diversity are key pillars for virtually any business, and the craft beer industry is no different. To that end, the Brewers’ Association, craft beer’s trade association, has released a 5-part series to serve as a guide to help brewers and breweries embrace diversity in all aspects of their business. The folks at Vinepair sure like their lists, and their Top 10 Beer Destination list for 2019 is no exception. The list isn’t as esoteric as last year, when they were sending you to Madison, Wisconsin and Richmond, Virginia. But some lesser-known cities like Rochester, New York and Raleigh, North Carolina join locations like Paris, Berlin, and New Orleans. Related: We had Vinepair’s 2018 list AND originally discussed the Downtown Disney/Ballast Point story in Volume 29 of the Six-Pack! Finally, the state of California spent a lot of 2018 being devastated by wildfires. Sierra Nevada Brewing Company is doing their share to help the state get back on its feet, and has enlisted many of its craft beer friends to add their support. Late last year, Sierra Nevada released Resilience Butte County Proud IPA, with proceeds from the beer going to the Camp Fire Relief Fund (the Camp Fire being the later wildfire that burned over 150,000 acres, destroyed 13,000 homes, and impacted many of Sierra Nevada’s employees). SN then took things a step further by releasing the Resilience recipe and having their suppliers provide ingredients at no charge to ANY brewery that signed up and committed to making the beer for free and sending any proceeds from the beer’s sales to the Camp Fire Fund. Over 1,400 breweries (SN has the full list in the link above) signed up. You may have already started seeing the beer at your local brewery, or it may be coming very soon. Christmas is fast-approaching, with the official start of Winter approaching even faster. With that in mind, I thought I’d throw down some quick thoughts on a handful of recent seasonal beers that I’ve had. Highland Cold Mountain Spiced Ale-Highly enjoyable. As someone who does not necessarily care for many of this season’s beers, which can be overly sweet, I find Cold Mountain had a terrific balance of sweetness, spice, and other usual notes (like vanilla and dark fruits). River Rat Winter Warmer-Not bad overall, though I felt like I was drinking the can a little bit in the one I had. Nice sweet and spice levels, though. Abita Office Party-Abita’s limited-release Holiday Stout—they also have. Again, not bad overall (better than my River Rat experience). Quite mild overall. Not a lot of sweetness, and spices are present but not overpowering. That puts it right in my wheelhouse, hypothetically. It just needs…something…to be great. I also had the Sweetwater Festive Ale, but that was a while ago, and it made so little impression that I can’t really recall anything, other than I wasn’t overly impressed. Take that for what you will. Cottontown Brew Lab has been a member of the Columbia beer scene for a couple of years now. Originally a production-only facility, they opened up an outdoor Beer Garden over the summer at their location in one of Columbia’s historic downtown neighborhoods, the eponymous Cottontown. Their goal is to embrace the “Famously Hot” nature of Columbia, South Carolina, and present a core line-up of beers that are enjoyable even on those unbearable high humidity, near-100 degree days that dominate the area for most of the summer. I’ve had the opportunity recently to try a couple of offerings from their core line-up. Their Blue Zip Tie IPA comes in at 7.6% ABV and 80 IBU, and strikes a remarkable balance of flavors and aromas. I got plenty of maltiness (I believe caramel malts) and dark sweetness to go a mild hop bite and notes of pine and plenty of aromatics. Again, generally light in nature, and pouring a fairly clear golden color, I found this to be a nice IPA whose balance makes it different from many of the others. Second up is the Carolina Crush Session IPA. It pours a hazy yellow-gold color, and clocks in at 4.5% ABV and 25 IBU. Also fairly light and fairly straight forward in flavor, with hoppy pine and dank notes. They also nailed the “trick”, as I felt like I was getting citrus zest notes throughout, but the brewers claim that no fruit is used in the production of this beer. A solid session beer. The biggest thing from the back end of the trip was the visit to Sierra Nevada Brewing Company’s East Coast production facility, located just outside of Asheville in Mills River, NC. It’s right next to the Asheville airport, but given how much green land SN bought up (it’s about a quarter- to half-mile drive through forest to get from the front gate to the brewery. You’ll notice throughout the parking lot there are several “trees” made out of solar panels, which help provide power for the facility. One of several glorious exterior shots. The brewery nails a naturalist-meets-Willy-Wonka aesthetic, and as colleague described it to me, the place was designed for brewery tours. Indeed, they hold numerous tours of varying content and levels of detail each week. And if you want to go at your own pace, there is a several hundred foot-long corridor with expansive top-down views of various parts of the production process, an in-depth description of the production process, and many displays highlighting the history of beer in general and Sierra Nevada specifically. Bottles from throughout Sierra Nevada’s history. There are spacious sit-down spaces both inside at their tasting bar/pub AND outside behind the brewery, as well as a high-gravity beer bar just upstairs from the main tasting bar. The Sierra Nevada brings together just about every SN beer you can think of. Without a doubt, the brewery is absolutely beautiful. I’ve seen more than a few self-guided brewery tours in my time (they are a requirement before drinking in a brewery in New Jersey). This one blows EVERY ONE away. It helps that Sierra Nevada’s a big boy in the craft world, but they nailed the brewery experience in every way at the Mills River brewery.